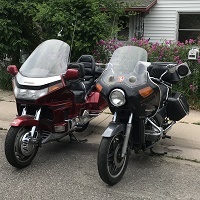 OK. . . My 92 Goldwing Interstate has, over the past couple of months, gotten very hard to start when cold(first start in the morning). I can crank, and crank, and crank for about two minutes and run a nearly new battery down too low. Then I jump it off with my truck and after about ten minutes it will backfire a couple of times and spit back through the carburetors, and then maybe backfire again. Then it will start up and run very well (choke on) and I start lowering the choke to keep it running under two thousand RPM. After it warms up a little I can shut it off and come back in a few minutes to start it up easily, (turn the key and touch the start button), and it is running. The rest of the day it starts immediately every time. I am thinking maybe carb troubles but, it starts so good the rest of the day and runs so well that I am not sure what to look for. It accelerates quickly and is very responsive after that 'first start'. Air filter is good and fuel filter has recently been changed. Tried with fuel cap loose. Even removed vacuum hose from petcock and hooked up vacuum pump. Any ideas? Anyone else run into this problem before? This almost sounds like the famous low-voltage to the ECU, when cranking a cold engine the starter draws more power than normal to turn over the engine with cold oil, might be drawing the voltage down to where the ECU doesn't have enough voltage to fire the plugs (a bad design, if you ask me, the ECU should have been made more voltage tolerant). Power to the ECU has to go thru a number of connectors and switches to get from the battery to the ECU and with time you may find the voltage drop from the battery to the ECU has increased due to age of the connections, corrosion etc. and the power available at the ECU while cranking may drop under 11 volts... No spark. An easy fix for this has been described in various threads, find the black/white wire feeding the ECU and coils. Clip this wire, and use it to trigger a relay instead of feeding the ECU and Coils. Run a direct line (fused) from the battery thru the relay contacts to feed the ECU and coils directly from the battery. The Black/white wire formerly feeding the ECU is now controlling the relay, so your BAS, Kill switch, ignition switch and all other functions will be preserved, and the ECU will have the full voltage available from the battery without the voltage drop caused by traversing all the switches and connections. Very Very excellent explanation! Good job! the 1500s do NOT start within about 5 revolutions, they are NOT going to start while cranking period. The battery cell voltage is too low to power up the ECM and make it fire the plugs. get an AGM battery and it should start before you can get your fingers off the starter button. if you measure the battery's voltage, while it is cranking, and it drops below 11.5 volts, that battery is toast. Mine behaves virtually identical to yours. The key to the question seems to revolve around how "cold" is "cold" ? 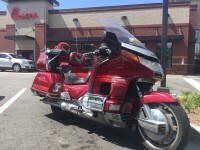 At a "cold" engine temp of 90F, I can just crank the throttle a few times to squirt some gas into the carbs, and start without any enrichment or choke at all. When mine is cold, 70F "cold", the enrichment/choke lever seems to work fine at about 1/2 travel to start almost immediately. After a few seconds, I throttle down the lever to keep below 2000 rpms, just like you. As the temperature of the engine drops, that 1/2 travel just doesn't cut it. 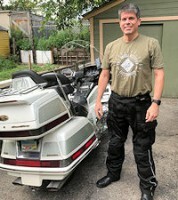 We get very little cold weather here in Tampa, and when it is that cold, I'm not generally riding the bike. So I haven't got a solid method for starting in 50F - 40F temps. However, I suspect that full enrichment/choke lever travel to maximum enrichment is probably called for when the temps get that low. I have a hard time getting myself to do that, as I fear flooding the engine, since it seems so extreme. I have had 3 other bikes in my life before the 1500. But, I do recall classifying them as either cold natured, or warm natured. The cold natured ones being difficult to start and idle in cold weather, or even under any cold start condition, such as first start of the day. The 1500 is definitely a cold natured machine. Full Choke or enrichment may help your situation if you are not already using it that way for your low temp starts. If it doesn't work the first time, you might even try cranking the throttle a couple of times before the second try, to squirt gas in there, and see if that helps. I believe the issue simply revolves around a lack of adequate gas supply under those conditions. BTW, I do believe in AGM batteries, and that's all I have ever used. The current one being only a year old. Mine even with AGM battery you can crank all you want and it doesn't start until you release the start button... Never fails to start, though. I'll likely apply the relay mod myself this winter. Wow! Exactly my symptoms on my 93 Aspencade. This morning it happened again and couldn't ride the beast. What a pisser. Anyhow, here is a question. I did do one thing that I didn't do before. After cranking, cranking, cranking,,,,, I put my nose on the exhaust and didn't smell any fuel. Certainly I would smell some fuel yes? So I am figuring the fuel pump or petcock?. I do hear a buzzing when ignition on. I thought the 93 GW's didn't come on when ignition on. I live in central Wisconsin.I just started mine this morning. 21 f outside about 30 f in the garage. This is my method. 3/4 enrichment(choke) . Hit the starter for 1 1/2 second, let go. I might have to do this 4 times but it starts when you release the starter. The low power to the ECU is the problem. In the summer my AGM battery starts it instantly , before I release the button. Once i had to give the throttle a twist for a blast of fuel. Just my 2 cents. The problem is not low power to the ECU, it's low power to the COILS. The coils are supplied power by the battery, and the coils are activated by switching the ground on and off for the other side of the coils, as seen in this circuit diagram. The GL1500 takes a HUGE amount of power to crank the engine and actuate the plugs, and if the voltage drops below a certain amount, the plugs won't actuate (even though the engine cranks). What happens to an electrical circuit when you attempt to draw more current than the power source is able to supply? The voltage drops. The bike requires a certain voltage level in order for the coils to convert that to a voltage that will create a spark across the plug tips. Because we are exceeding the current capacity of the battery when cranking the cold engine, the voltage drops. Because the voltage drops, the output voltage of the coils drop. Because the output voltage of the coils drop, there isn't sufficient voltage at the plug tips to create an electrical arc, so no ignition occurs. Once you let go of the starter, the current demand goes away, the voltage spikes back up, the plugs spark, and because momentum still has the engine spinning, it lights off and starts. So this is why you are having problems starting in cold weather. If this is the symptom you're having, the first thing I would do is clean and tighten all battery and solenoid connections. If that doesn't fix it, measure the battery voltage at the battery terminals while cranking - do it when it's warm (and starts normally), then do it when it's cold (and it won't start). If you see a significant difference, then the problem is very likely the battery. 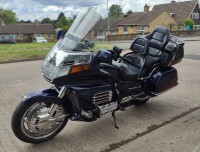 Replace it with a new, quality AGM battery, and keep it topped up with a Battery Tender whenever it is not being ridden. You're right of course. I knew it was the coils but for some reason I still said ECU. The relay mod restores the full power to the coils. I'll probable clean the related connectors someday before doing the mod though. I have been riding this bike for about five years and have never used a battery tender on it. It has always started right up, even first start in the morning. I just push the choke down, turn the throttle a couple of times, and press the start button. It would be running in less than five seconds. Being that I live in Jacksonville, Florida, the last few months have not seen morning temperatures below probably 75 degrees. I have started it up in the cold winter months the same way, very quickly so, this can't be because of cold weather. I am wondering if it is a temperature problem at all. Even when I jump it with my truck running which has a new battery it still won't start up, even though it spins very fast. And it must have spark because it backfires. Thanks for your help. Backfiring can be a poor spark only igniting once in a while. Correct. One of the most common cause of backfiring is a weak spark. You get one or two cylinders that skip a spark, even once, and you end up pushing unburned fuel/air mixture into the exhaust manifold. The next cylinder that DOES fire off, then exhausts its hot exhaust into the manifold, igniting the unburned fuel/air mixture, and BANG, you have a backfire. Is there a diagram as to which side of the black/white wire to connect to the relay? and which relay terminals connect to which other wires? Is it a normally closed or open relay? Is it on the battery + or battery - side? Some vehicles have battery + to the accessory and the switch etc is on the - side. A DIY posting would be great but, I haven't seen one. cranked it far longer than the other battery. That black/white wire guns through a 4-pin white connector on the way to the ignition coils. That 4-pin connector is behind the right inner fairing panel. That's the panel by your right knee when sitting on the bike. This is where some people put the relay to give full power to the coils. Furthering my hard starting issue, I have discovered the cause. Typically, I use the 1500 for work related commuting. Almost all interstate even though I don't like taking the slab, but time is the issue. I usually go about 80 -85 mph ( shhhh.. I didn't say that). That could be about 70% of the time. My bike was hard starting, even after charging the battery, it would backfire a few times. THe next day it would start right up. THe last time , no way Jose' it didn't want to do anything period so it was changed from "hard start" to "no start". I replaced the spark plugs about 13k ago and thought to myself I have nothing to lose. I replaced them and Bingo. Started right up. The plugs themselves didn't look bad. But obviously it was enough to not fire the plugs. The manual has shown that if You do "extended high speed riding" to use a different plug. That is the plug I have now installed. Has anybody used this plug and found a difference? Mighty obliged. That is exactly what I have done and shared in the link below in 2016.